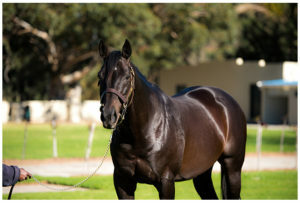 Highlands Stud part of Ridgemont’s triple G1 winning young stallion Jackson has made a very pleasing start to his stud career, and the son of four times Equus Outstanding Stallion Dynasty was responsible for a very impressive debut winner at Durbanville on Wednesday. Jackson filly Heaven’s Embrace, a 3yo from the first crop of her Derby winning sire, stormed home, from off the pace to make winning debut over 1400m –in the style of a filly going places. Ridden by Anton Marcus, Heaven’s Embrace defied greenness and ran out a comfortable one and a half length winner over tote favourite Minona. Trained, like Jackson himself, by Brett Crawford, the impeccably bred Heaven’s Embrace, a ¾ sister to G1 winner Lady Of The House, is yet another daughter of Jackson to make a favourable impression of late. Jackson is also the sire of talented filly Water Spirit, who got off the mark at just the second time of asking when running out a clear cut winner over 1600m at Durbanville on Saturday. Bred by Highlands, the 3yo filly had been a close second over 1200m when making her debut and is held in high regard by trainer Brett Crawford. Both Heaven’s Embrace and Water Spirit look sure to add further to their sire’s growing reputation in the Cape Summer Season ahead. 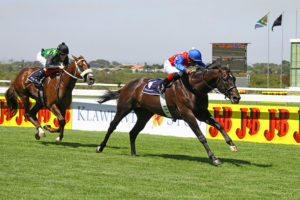 (Another 3yo by Jackson, the gelded Tennessee, caught the eye when running on for third place in Wednesday’s first race at Durbanville and he should get off the mark very soon). Now the sire of nine first crop winners, Jackson’s early notable performers also include G1 filly Can You Feel It and last season’s G3 Cape Of Good Hope Nursery third Mr Crumford. Can You Feel, placed in both the G1 Thekwini Stakes and G2 Golden Slipper last season, is currently third on the log for the R2 500 000 CTS Ready To Run Stakes due to be run next month. A record breaking sales topper from the 2010 National Two Year Old Sale, the handsome Jackson won six races, including all of the G1 Investec Cape Derby, G1 Daily News 2000 and G2 Champions Cup, and earned over R2.3 million in prize money. By one of South Africa’s best sires in the form of Dynasty, Jackson (whose relatives include breed shaping sire Smart Strike) has a single lot on offer at the 2018 Emperors Palace Ready To Run Sale, and four lots on offer at the 2018 CTS Ready To Run Sale.